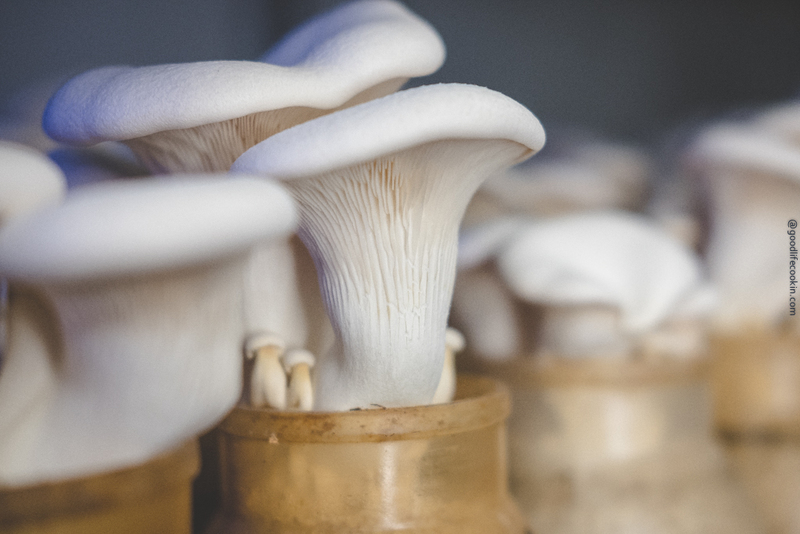 In this video, I tour Mycopia, a local Bay Area mushroom farm. I was super excited to learn about how all these different mushrooms were grown. I also got to take home a bag full of fresh mushrooms which I cook the second I get home from our trip to Sebastopol where the mushroom farm is located. Sebastopol is full of great cuisine and the town itself is very charming. We stop off at Slice Of Life for a quick bite to eat. Our, “quick bite,” actually turns into a monster feast, as Kitty and I order practically everything on the menu. If you didn’t catch the full review I did on Slice Of Life, definitely read that here! Our last stop was Tylor Maid coffee, which is by far, my favorite coffee in the entire world (not that I’ve had a ton of worldy coffee, but still!). Upon getting home, I put the mushrooms to the test. I sear some Velvet Pioppini Mushrooms up with garlic and pour over a quick miso soup! All in all, it was an amazing day, packed full of fresh mushrooms and good eats! A quick Japanese miso soup poured over some fresh gourmet mushrooms seared in garlic. Prepare the mushrooms by rinsing in cold water. Smash two cloves of garlic and slice thin piece of ginger. Dice up 1/4 cup of tofu and set aside. Soak dried Wakame seaweed in small bowl for use as toppings in soup. Heat small pot with 2.5 cups of water. Add ginger slice, two tbsp miso paste, 1 piece of Kombu, and tofu. Let boil for 10 minutes. When soup is ready, remove piece of Kombu and ginger. Pour over bowl of mushrooms, serve, and enjoy.